The cycling adventures and politically-incorrect opinions of a Boston-Irish Flahute. Fast Eddy's blog is back! Welcome to the Wielercafe! This blog is the new home of my old blog, 'Flandria Cafe'. I started bicycle racing New England roads way back in 1976 when shorts were wool, helmets leather and $250 could snag that white Peugeot PX10 that was all you needed to jump in the pack with the best. A half-decent sprint brought modest amateur success, earned me the nickname “Fast Eddy” and fueled an indelible cycling obsession - launching a lifetime in roles orbiting in and around cycling. Top category amateur racer, founding member of New England’s most prestigious cycling club, product marketing manager for global cycling brands, European bike-biz veteran, creator and owner of one the coolest road-bike shops ever, occasional drinking partner of professional cycling champions. At age 57 in my spare time I’m still an avid cyclosportive and cycling travel adventurer, and not mellowing with age. A passionate cycling fan, I've collected just enough experiences to be dangerous. 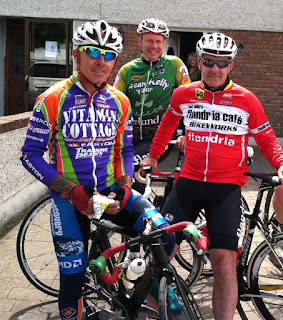 Warning for the politically correct: My world view on cycling and life is unapolgetically old-school, euro-centric, opinionated, and as hard-hitting Boston-Irish as a Dropkick Murphy’s soundtrack.